The band field work day remains scheduled for tomorrow morning at 8:00 am. Please bring garden rakes, shovels, and wheelbarrows. We will be spreading topsoil, leveling potholes, and reseeding portions of the field. See you there! Because of the threat of severe storms tonight and tomorrow and the concerns for the safety of all involved, the band field work day for Saturday, 4/24/10 has been rescheduled. We will plan to work next Saturday, May 1 at 8:00 am. Please plan to attend. Many hands make light work! Thanks to all who volunteered. Congratulations to Jacob S, our new drum major for the 2010-2011 season. Both candidates did an excellent job preparing for the audition, and I look forward to a successful season for all. The band banquet ticket reservation form has been posted on Yahoo Groups and will be on the website soon. All details are on the form. All band members (including beginners!) and auxiliaries are encouraged to attend. We need some help from volunteers, so please consider indicating that on your form. Due date for forms and fees: May 4. Thanks to the following persons who signed up to work this Saturday, 4/24. More help is needed from any volunteer willing to come. We'll meet at 8:00 am. Please bring wheelbarrows, hard rakes (garden rakes), and shovels. We will be spreading topsoil, leveling, and reseeding a portion of the field to prepare for the upcoming season. In the event of rain, the workday will be rescheduled for Saturday, May 1st. 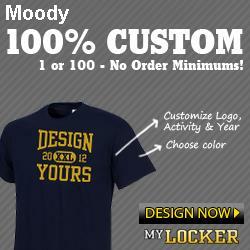 We just added the Moody Band Handbook for 2010-2011. You can view this in the Handbook section or view/print the form in the Forms section. Also, added the Band Camp Check-list to the Forms page. You can view/print the check-list. Here is the chair placement audition schedule for next Thursday afternoon. The practice rooms are located in the Goodwin Music Building on the Auburn campus. We will have an important meeting for all Moody band parents and students, including beginning and intermediate band members and auxiliaries, in the school lunchroom next Tuesday evening, April 13, at 6:30 pm. In addition to receiving vital information on the upcoming marching band season, the band boosters are introducing an exciting new alternative to band camp fees! Students will bring letters home tomorrow to be signed and returned confirming your attendance at the meeting. If you are unable to attend, please be sure to contact Dr. Sargent at brad.sargent@sccboe.org and leave a number and time when you can be reached. Everyone needs to understand how this new opportunity is going to work! The following is what I know about All-County band. I will provide more details as I learn of them. For those attending the prom Saturday and encountering a scheduling conflict, please do not ask the all-county organizers to excuse you from the concert after making a commitment to rehearsals. We may or may not have a scheduling conflict, but if so, you'll need to make a choice. I hope everyone will consider auditioning for all-county. It should be a good experience. Auditions: Thursday, April 8, 4:00 pm, at the new Leeds High School, 7160 Coosa Ave, Leeds, AL 35094. Rehearsals: Friday, April 9, 9:00 am-4:00 pm, and Saturday, April 9, 9:00-11:00 am, Leeds High School. Concert: Saturday, April 10, Call Time 12:30; Concert at 1:00. Fees: $30.00 per student, which includes lunch on Friday. Percussion: 1. Triplets-- slow to fast and fast to slow; open to closed to open. 2. Sight Reading. Winds: 1. Three chromatically adjacent major scales. 2. sight reading.